MANILA – September in Manila is the best time to get the party started. Cove Manila, Southeast Asia’s largest, world-class indoor beach and night club, is gearing up for a full party season this September 2018, complete with the hottest music acts from around the world, great food, free-flowing drinks, and an unparalleled ambiance for the metro’s most discerning social butterflies and party-goers. 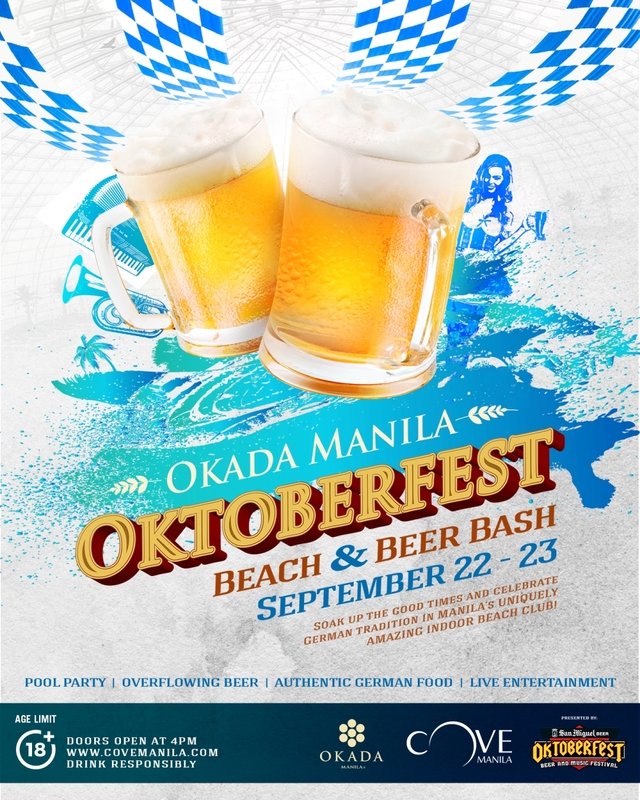 First on the list of the club’s exciting roster of events are a line-up of international DJs and the upcoming authentic German Oktoberfest. Kicking off the Cove Manila party season is a series of epic parties with music spun by globally renowned DJs. Every Friday starting September 7 from 10:30PM to 5:00AM is an opportunity to take part in this superb, must-see experience that you can’t miss out on. Platinum-selling Swedish musician Steve Angello (formerly of the phenomenal supergroup Swedish House Mafia) headlined the September 7 party, much to the delight of guests who spent the night dancing to world-class electronic music. Los Angeles-based DJ and producer Valentino Khan, best known for his chart-topping collabs with Diplo, Skrillex, and Steve Aoki, will spin the house down on September 14. 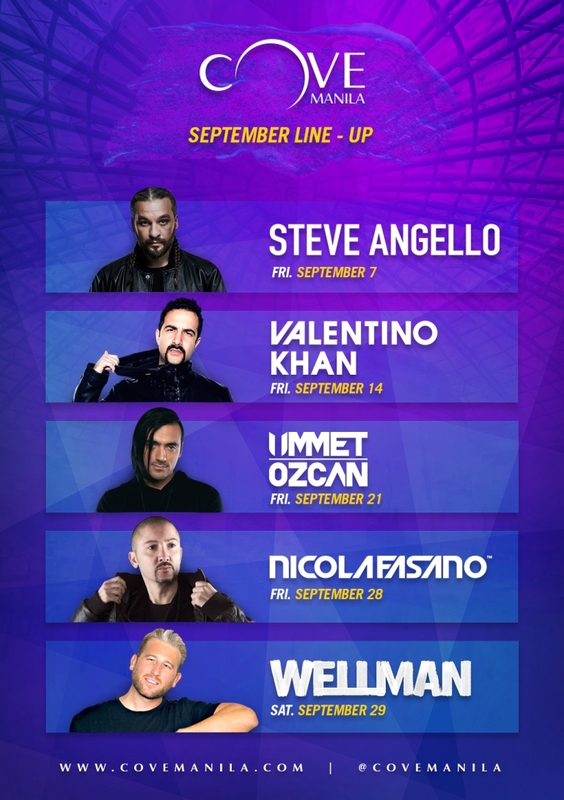 The party just never stops at Cove Manila as Dutch-Turkish DJ Ummet Ozcan (September 21), globetrotting Italian record producer and DJ Nicola Fasano (September 28), and Las Vegas legend DJ Wellman (September 29) are set to bring their signature beats to the indoor beach club. Let your hair down and dance to the exhilarating beats while enjoying an amazing, one-of-a-kind ambiance. The more people, the merrier the party, so bring the whole gang for an unforgettable night and book your own tables and cabanas! 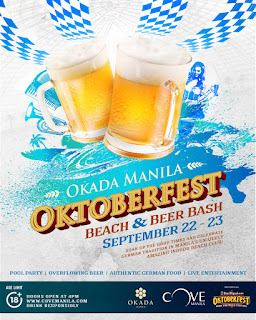 On September 22 and 23, Cove and Okada Manila will host an authentic German Oktoberfest experience in partnership with the iconic San Miguel Beer. Leave the lederhosens at home as this Oktoberfest is a tropical one, complete with a pool-party ambiance, tents, amazing music from live bands, and authentic German food! Fill your steins with ice-cold San Miguel Beer and indulge in a feast of wursts, cheese, and roasts, complete with traditional German sidings and condiments. Can’t get enough beer and German food? Here’s the best part—there’s a VIP package that lets you indulge in free-flowing beer and unlimited German food for eight hours and will definitely leave you feeling wunderbar! Get the party ball rolling only at Cove Manila. For more information on ticket prices and upcoming event schedules, log on to www.covemanila.com, like Cove Manila on Facebook, and follow @covemanila on Instagram and Twitter.